Cloud users are always enticed by the idea of using third-party apps with their official Google accounts, not recognizing the potential threats that this can pose to the confidential organizational data. Knowingly or unknowingly, employees in any organization open third-party apps, sometimes with a good intent, i.e. to be more productive in work; but still this could cause lapses in the data security systems as not all have a clear intent while they access such third party apps as we can also never rule out the intrusion of outside malicious attempts and even the havoc can be caused by some insider attack too. So, all-in-all, free access to third-party apps means a true alteration from sturdy cloud security protocols and comes against enterprise security policies. 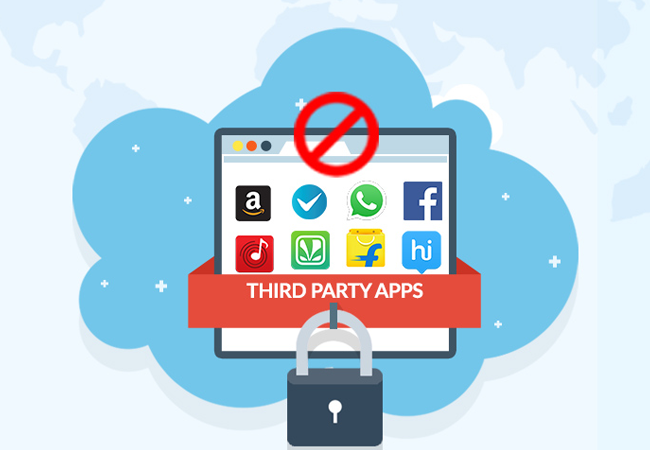 Thus, third party app restrictions becomes necessary for organizations working on cloud to understand and restrict access to such third-party apps, which might lead to data thefts by stealing confidential data that is being exposed either knowingly or unknowingly. CloudCodes for Business entails an all-encompassing approach, its Access Control module exactly works on addressing any such threats to data security breaches. The Access Control module with third-party access restriction feature has a provision to restrict such third-party apps, mostly the unsanctioned apps, and helps ensuring that cloud users do not sign in to any such potentially dangerous third-party apps. This Access Control third party restrictions policy also holds true when a user logs into the cloud for the first time and prompted to “Sign in with Google” by any third-party app, and then, CloudCodes CASB solution is thoroughly capable in discouraging and restricting any such potentially harmful sign-in attempts using official Google accounts. Stringent cloud security regimens of sanctioning only one particular app or only a few apps and blocking all other apps as organizational security strategy is really not a very helpful protocol when we talk of real-world cloud work scenarios in today’s era. This is because, the office staff might need to collaborate and communicate with business partners, vendors, suppliers, and customers; so they might need to test and use some innovative third-party cloud apps. IT admin really can’t administer all these cloud apps. And also, creating any stringent exception sprawl might lead to the inappropriate use of even worse apps than those which have been blocked by the admin and office staff might even start using some personal forms or corporate forms of the apps that have been blocked, which is even more dangerous for company’s data health. So, blocking all these apps might not be the solution, and this is where Cloud Access Security Brokers pitch in. CloudCodes CASB solution ensures better enterprise security via much better Access Control through this third-party access restriction feature. Apart from this, it’s also possible for admin to enforce access restriction policies to restrict the users from accessing these 3rd-party apps, which are otherwise used via official Google Apps Login. This can be done by putting the blocks proactively to prevent the access, creating whitelist of sanctioned third-party cloud apps, and reporting the admin about any inappropriate access attempts. Third party app restrictions feature of CloudCodes for Business is highly efficient for organizations that are seeking to check any such wrong access attempts for restricted/unsanctioned third-party apps.